Chicago Cubs starting pitcher Andrew Cashner delivers during a baseball game against the Arizona Diamondbacks in Chicago. Mike Quade prefers to think of all the good things the Cubs showed him in their first homestand rather then dwell on their record. Chicago made three errors Wednesday in a 6-4 loss to the Arizona Diamondbacks that dropped the team to 3-3 in a season that began with series' against a pair of last-place ballclubs. The Cubs lost two of three to the Pirates, last in the NL Central last season, then took two of three from Arizona, the West's worst last year. "There is so much good to take out of this even though you lost," Quade, in his first full season as Cubs manager. "You hope to build on through the season. "There was a lot of good to take out of what I saw on this homestand," he said. "I would have liked to have taken all that good stuff and been 5-1 or 4-2, but that's OK."
Quade's day began with the news that Cubs starters Randy Wells (right forearm strain) and Andrew Cashner (strain in right rotator cuff) were headed to the 15-day disabled list. "Everybody understands that we're going to need contributions from all over the place," Quade said. "I don't think anybody is going to try to do too much." Alfonso Soriano hit his third homer of the season but made an error in the field, and Aramis Ramirez hit his second for Chicago. "We've talked about the speed (Soriano) no longer possesses and how his power numbers are going to be so important for us," said Quade. "Boy, three home runs in a homestand is pretty good. That's a nice pace." Chris Young drove in two runs, scored twice and made a pair of nice catches in center field as Arizona ended its eight-game losing streak against the Cubs. "(Young) had a great game, offensively and defensively," Arizona manager Kirk Gibson said. ``He made three great plays, hustled on the bases. I moved him up and it was big for us. He had a great game." Armando Galarraga (1-0) won in his first career NL start, giving up five hits and four runs in 7 1-3 innings. J.J. Putz pitched a perfect ninth for his second save. "He pitched good," said Gibson. "Gave us seven-plus. He wanted to stay in there, but he'd done his job. Over 90 pitches, first start out. Our bullpen, good support for them to gain confidence as well." Gerardo Parra had three hits and scored a run and Miguel Montero hit his second homer of the season for the Diamondbacks. Ryan Dempster (0-2) gave up five runs -- four earned -- and 10 hits in seven innings. He struck out seven and didn't walk a batter. 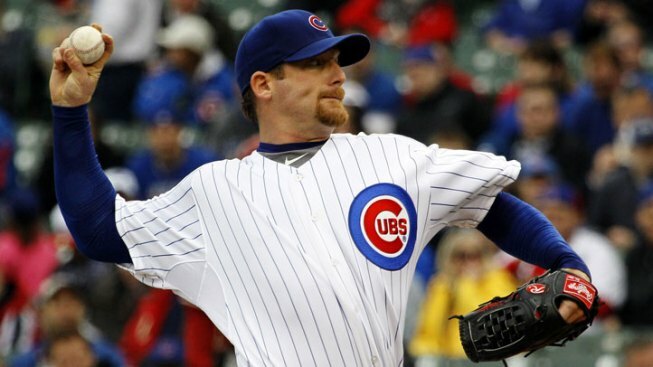 "I made a lot of good pitches today," Dempster said. "Sometimes, if you just make a little better pitches here and there it would have helped to get ahead in the count. For the most part, I like the way I was throwing the ball." After the Cubs tied it in the fourth, Arizona scored three times in the fifth. Young lifted a flyball into the left-field corner, which Soriano tracked to the wall. But the ball glanced off his glove as he reached the yet-to-bloom ivy. The play was scored a double. Young went to third when a relay throw got away from Cubs catcher Geovany Soto, who was charged with an error on the play, and scored on Kelly Johnson's double. In the third Soriano was charged with an error backing up a play. Young hit a sinking drive to center. Cubs center fielder Marlon Byrd, in an effort to save a run, raced in and reached for a shoestring catch. He came up short and the ball rolled well behind him. "An inch here and there, I catch that ball and it's 0-0 instead of 2-0," said Byrd. "I'm always going to be aggressive. Hopefully, I'm going to get that ball the next time." Soriano bobbled the ball while backing up Byrd. That allowed Young to score. The play was scored a triple. An error was charged to Soriano. "Sori was busting, trying to get that ball," said Quade. "He was trying to be too quick getting the ball into the infield. (You have to realize) it's a triple, so secure the ball and get the ball into the infielders." Soriano agreed, but added that he needs to be able to make the difficult plays. "The second one, I got very close and the ball hit my glove,'' said Soriano. "I think I can get better. They were two tough plays, but I'm going to keep working and make those plays." Now the Cubs head to Milwaukee to begin their first road trip of the season. "We played well," Byrd said. "There are no negatives. Now it's time to go on the road and see what we're made of."